One can only plan but He decides. I plan to breastfeed Babycakes for as long as I can. When she was born, my short term goal is 6 months and when she turned 6 months, my short term goal is 12months. Now that she's 12 months, my goal is 24 months. I mean, I've survived and succeeded breastfeeding for 12 months, so what's another 12 months, right? So, Babycakes turned 12 months last week, 27 September 2012. We bought a cake for her teachers at the nursery, we went out to dinner at Chili's BSC and on Sunday 30 September 2012, we had a birthday party for her together with my dad's birthday (which fell on 26 September 2012) and also a belated raya open house. It was pretty huge and the crowd was huge. Alhamdulillah it was a success. I'll blog about it in another post, Insyaallah. One week before her 1st birthday, Babycakes got really sick. She was fine over the Hari Malaysia long weekend but she got really sick on Tuesday. She was restless, crying non-stop, she had fever, runny nose, she threw up milk, she had diarrhea, she lost her appetite, she was coughing and this went on several days and then she got a thrush/yeast infection in her mouth. It was a very tiring and trying week for us what with the lack of sleep and all. I had a full trial that week so we had no choice but to send her to the nursery. However hubby picked her up early. Due to the stress and lack of sleep, my supply dropped tremendously. Well, i would like to believe it was associated to that coz I am still eating as usual and drinking as usual. I did not change my diet at all but the drop was very drastic. Alhamdulillah Babycakes recovered a few days before her birthday, albeit not fully. She is now back to her old bubbly chirpy noisy cute little self. Whenever I pump now, I no longer get the amount I needed. I can barely make 3oz per session. Yes, it is THAT drastic. Her stash is slowly but surely diminishing. I almost bought a Shaklee set but gosh they were too expensive! I am still taking Pil ASI and I just started taking pil habbatus sauda. I may need to start supplementing with a formula soon. It is very sad for me to not be able to make anymore milk for Babycakes but I am still trying. I plan to still bf her at night and on weekends but I may have to send formula to her nursery. That way, she will still get the benefits of bm. And how appropriate is it that I get a free sample of milk from Enfagrow A+ today? Tomorrow is Babycakes' appointment with her paed so I am gonna ask about which milk is best to be introduced to her at this stage. Mums out there, if you are reading, what milk brand would you recommend? same thing happened to imran when he was about to turn 1 dulu. muntah cirit for almost 3 weeks. 2 clinic visits did nothing to him, then we brought him to paed, he was given live culture meds to neutralize his tummy (too acidic katanya), my bm dropped tremendously, almost none. the paed suggested pediasure milk sbb imran was lactose intolerant and that time he lost lots of weight. so pediasure can replace meal even if imran tak mkn. almost 4 y/o now, he's still drinking pediasure. BUTTTTTT....pediasure is freaking expensive!!!!!! 900gm is about rm77 and 1.8kg is rm140 something. nangis!!! think twice, double twice, triple pun boleh, before you decide to give irene pediasure or any of the susu yg jual dlm glass cabinet kat tesco/giant tu. those milks are over the top punya price range. I rasa Irene tak lactose intolerant kot sebab makan cheese, butter ok je setakat ni tapi tak taulah camne dia akan react bila minum formula nanti. Harap2 ok lah. 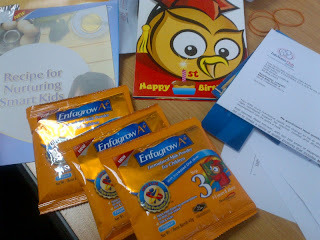 I ingat nak try sample Enfagrow A+ tu dulu. Antara susu2 yang I consider ialah Dutch Lady, Anmum, Dugro, Mamil, Enfagrow tapi I pun tak survey lagi harga nya. Sedih ok bila susu dah kurang. Dulu mencurah2, penuh2 botol. Freezer pun sampai tak muat2. Rasa down gila sebab cam ruginya takleh fully bf dah. Tapi the more i stress about it, the less milk I will make anyway. it's a vicious cycle.